Farney returns to the linebacking corps as the Tritons’ unquestionable leader on defense. Last season, Farney was third on the team with 81 tackles and was the non-senior in the top 10 in tackles for San Clemente. At 6 feet, 180 lbs., Farney is also versatile and quick. He had five sacks last season. 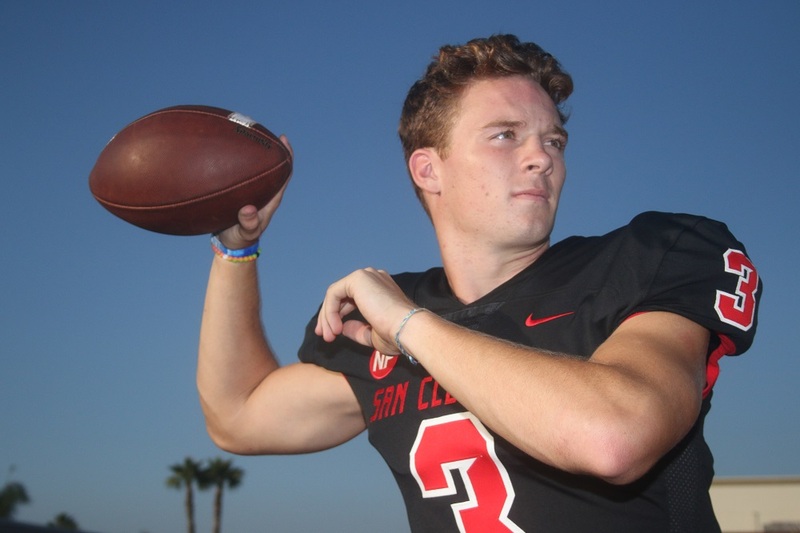 Krebs goes from rival to teammate as he transfers to San Clemente from Mission Viejo. Krebs was the leading junior tackler for Mission Viejo last season with 38 total tackles and was fourth on the Diablos with three sacks. Krebs, at 6 feet, 203 lbs., will be another active linebacker for the Tritons. Thomas will lead things up front on another part of the Triton defense hit hard by graduation. Thomas had was the No. 2 junior in tackles last season with 31 on the line last season. He will provide a quick and physical presence in the trenches at 6-foot-1, 200 lbs. Ferrell is another of the many seniors stepping in to replace graduating seniors, and he’ll be looked to as a leader of the patrolling secondary. At 5-foot-8, 185 lbs., the speedy Ferrell was the No. 3 junior in tackles last season with 15 solo tackles of his total 22. A major weapon in the battle for field position, Bein is critical to the Tritons’ special team efforts. The recent Air Force Academy commit averaged 32.1 yards per punt last season for San Clemente, and Bein said he’s looking to up his average to over 40 yards and improve his directionality. Costello continues the tradition of San Clemente signal-callers advancing to the NCAA Division 1 level with his commitment to Oklahoma State. Last season, Costello threw for 2,132 yards and 23 touchdowns and ran for 392 yards and five TDs. The Tritons will go with the 6-foot-1, 185-lbs. Costello this season. Baggs makes up the first half of the Tritons’ twin-tower tight ends. At 6-5, 228 lbs., Baggs will be a can’t miss target in the Tritons offense that, like quarterback, has produced a string of Division 1 tight ends. Last season, Baggs caught only six passes but two were for touchdowns. Lush is the second half of the Tritons’ twin-tower tight ends. Lush stands at 6-foot-5, 235 lbs. and will be just as important in the Triton offense. Lush missed his junior season with a torn ACL but has come back strong. Lush currently has college offers from Brown and Cornell. Young is the leader up front for the most important unit of any football team. Young believes his offensive line has really improved over the offseason, and they’ll need to be with the strong schedule ahead for San Clemente. The line will protect Costello and open holes for what could be an explosive running game. Jenkins will be looked at to step up on the outside of the Tritons’ offense. The 6-foot-3, 180-lbs. wide receiver is the only returning wideout for San Clemente. Jenkins caught eight passes for 136 yards and two touchdowns as a junior, and he will get a considerable increase in looks in 2018.